Even though the sweets taste like sugared chalk, I’m guessing we have all had a Pez dispenser at one time or other in our lives. 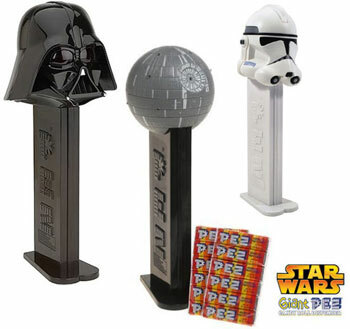 But perhaps not one as cool as these Star Wars-themed Pez dispensers. Take your pick from a Darth Vader, Death Star or Stormtooper, all 12 inches tall and packed with enough sweets to keep you hyperactive for hours. And not only that – they also light up and play the Star Wars theme. Expect the three models here to be followed by C-3PO, Chewbacca, R2-D2 and Yoda, all selling for around the equivalent of £10 each.